PLEASE NOTE: "Moonlight Cottage" sleeps 4 people only, in one double and two single beds. Surrounded by pine plantations and the vineyard, there is no false sense of seclusion here - it's the real thing, yet it's just over an hour's drive from Melbourne. Set on a 4,000-acre cattle and sheep property, this delightful sand-stone cottage makes an idyllic retreat for city slickers who want to get away from it all. The beautiful cottage takes its shape from 19th century settlers' cottages, but incorporates every 21st century luxury. It overlooks two tranquil trout-stocked lakes and a vineyard planted with cabernet sauvignon, merlot, and more recently, pinot noir. A bottle of the property's wine, an excellent drop bottled under the Bungeeltap label, is left for guests as a welcome gift. With a big slow-combustion fire at the heart of its open-plan living area, beautiful handmade quilts on the beds, warm polished timber floors covered with country-cottage rugs and a deep claw-foot bath in the heated bathroom, the whole cottage exudes a warm welcome. Each of the two bedrooms has French doors opening onto the verandah, which wraps around three sides of the house. The larger is furnished with a queen-size wrought-iron bed, blanket box and a delightful shabby-chic wing-mirror and wardrobe. The other, decorated brightly in reds and creams, has two single beds. Details such as dado panelling and thoughtfully chosen furniture add to the settlers-cottage ambience, while creature comforts and entertainment have not been forgotten. The cottage has reverse-cycling air-conditioning, TV/DVD/CD facilities with a selection of CDs, DVDs, games and books; big, comfy fireside sofas; and a fully equipped kitchen. On a pleasant evening, you may choose to enjoy cooking outside on the barbeque. Pick up your supplies at Bacchus Marsh or Ballan on the way through to Sherwood Grange Retreat, as there are no shops in the immediate vicinity. Guests are welcome to fish in the two lakes, stocked with rainbow and brown trout. The fish are "wild", feeding naturally on insects and providing a wonderful angling challenge. Bait fishing is not allowed (fly and lure fishing only), and guests may take one fish to cook for themselves at the cottage. Others should be carefully released. You might like to try your luck with the yabby pots too. Sherwood Grange is managed by Joe Toohey, a hearty farmer who oversees the day-to-day running of Sherwood Grange. Joe is a wealth of information about everything local. If you find yourself yearning for the big smoke, Ballarat is only 30 kilometres away, with its wide tree-lined boulevards, cafes, lakeside restaurant, art galleries and historic museums. 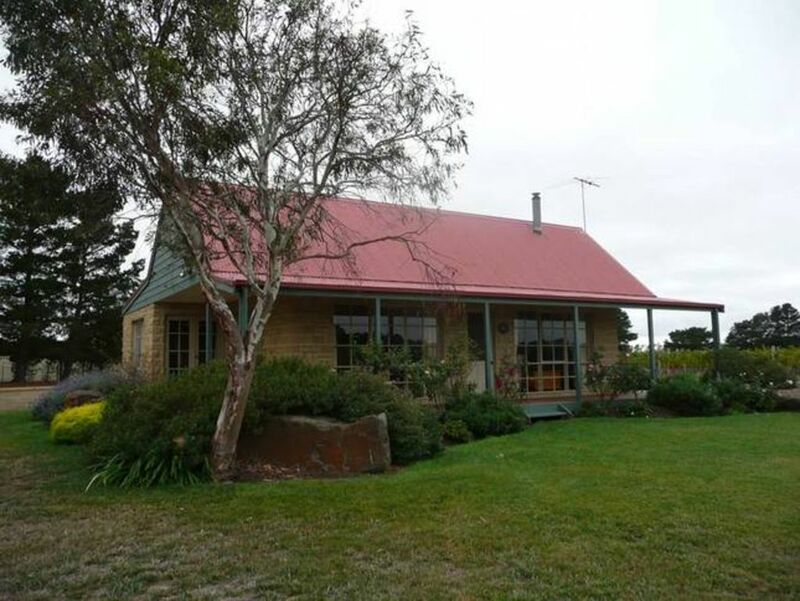 Also nearby are Daylesford and Buninyong, a 20 minute drive away. But it's easy to kick back and enjoy the views, fresh air, wildlife, rhythms of the farm and tranquility. Why leave? NOTE: Weekly and nightly prices are for two people in one cottage. If you need more room, see our other cottage at HomeAway #4935003. A beautiful location, serene, peaceful, a world of its own. An easy drive into nearby towns, Ballarat & Daylesford for instance made it simply a perfect few days escape from the "real world. "Surrounded by vineyards and a fish filled lake, no city noises just the sounds of nature, cows in the paddocks, the occasional kangaroo and birds in the trees.Magnificent is an understatement.All this and a bottle of 2003 Cab Sav, produced on the property, awaiting our arrival was a pleasant and welcoming surprise, and went down very well too!Can't recommend Sherwood Grange highly enough, we'll be back. Such serenity! An extremely comfortable, well catered setup. We very much enjoyed the complimentary bottle of Pinot Noir. The views were beautiful, the cottage was absolutely lovely. It was a cold weekend but we were cosy with the fire. My partner and I agreed that we could quite happily live there! My highest recommendations to anyone who needs to be far from the madding crowd (but still a stone's throw from 'civilisation'). Ideal! !